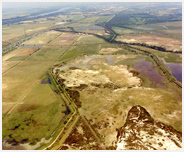 Often difficult to observe, mammals are well represented on the Vigueirat Marshes as 43 species have been recorded there. The variety of habitats explain this diversity. 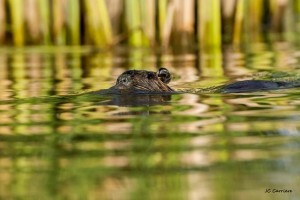 The signs of beaver presence are regularly noted on the Vigueirat canal and even on some smaller canals northern the site. It is on the same canal that in 2012, a European Otter left feces (term used for the animal poop). The site offers many advantages to accomodate sustainably this iconic wetland species whose last core population had died in the early 90’s in the Rhône delta. Channels are home to other species such as water vole and water shrew whose populations have suffered from the draining of many wetlands. 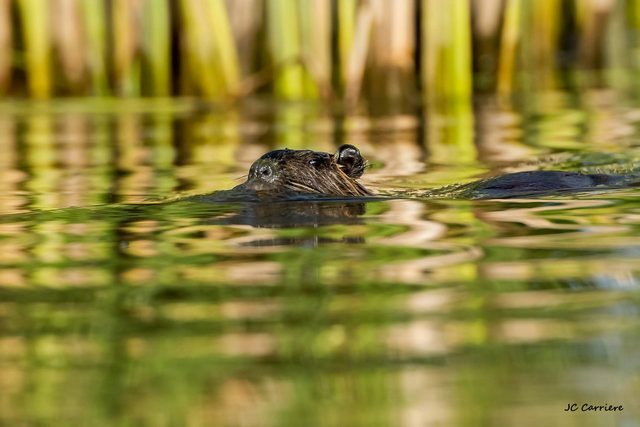 introduced in Europe for its fur, the coypu has colonized all the marshes. Although sensitive to strong cold waves, this large rodent has adapted perfectly and is now part of the Camargue ecosystem. The higher areas (safe from flooding) host the burrows of the badger and rabbits. For carnivores, the red fox is frequently observed while the mustelidae (Weasel, Polecat and Beech marten) are very discreet. The wildboar, like everywhere in the Camargue, frequent all habitats. In spring, the wild sows give birth in the reed beds, in the summer, the wild boars dig the mud in temporary swamps that dry up to eat fish. It is in winter, when using dykes to move, that we can more notice their presence, mudflows and footprints betraying their passages. Hares are stationed on former farmland located west of the Canal from Arles to Bouc. For several years, hares coexist with the Iberian hare introduced by hunters in the region.The majority of small mammals was inventoried through analysis of barn owl or tawny owl pellets. According to experts of this group, the harvest mouse is present in the reed beds that are its favourite habitat. 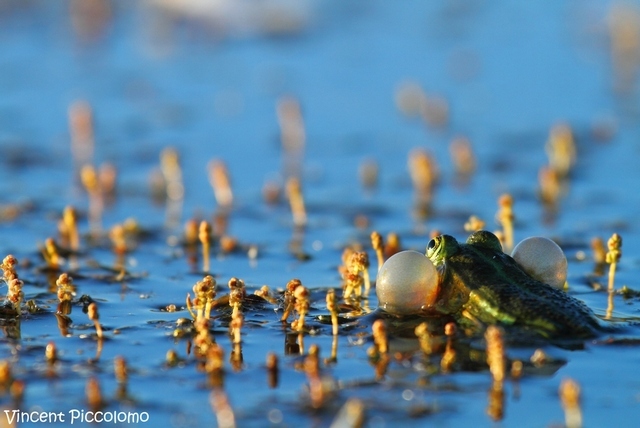 Six amphibian species are present on the Vigueirat Marshes. Three species are common : the Mediterranean tree frog that is often found in the vegetation lining the canals. This little frog whose color varies from apple green to dark brown can be exceptionnaly blue. It often betrays its presence by its particularly powerful song. The two others are the Perez’s frog and the marsh frog that is very similar and can even hybridize to give the Graf’s hybrid frog. The marsh frog is an introduced species native to Central Europe. These species are much more aquatic than the Mediterranean tree frog. Two species of toads were seen occasionally on the site : the common toad and the natterjack. So far, no evidence of reproduction of these species was observed on the site. Some individuals of crested newts were found in the 1990’s in the southern part of the site. Since this species has never been seen again. It is not possible to conclude that it disappeared because of its small size and discretion. At the Vigueirat Marshes, most of the Camargue reptiles can be observed, some are very discreet but with a little patience you can see the species described below. 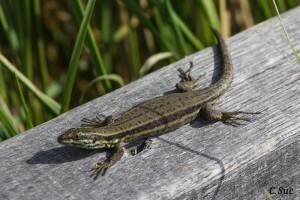 The common wall lizard is visible very easily on buildings but rather meets everywhere on the boardwalk. The green lizard can be seen on the dikes often under brambles where it can quickly hide. Two other species are also present : the slow worm and the western three-toed skink, but their observation requires a lot of attention and luck. A gecko appeared ten years on the site, it is the tarentola mauritanica that is frequently observed in urban areas. Some individuals have already been observed in the evening on the walls of buidlings. 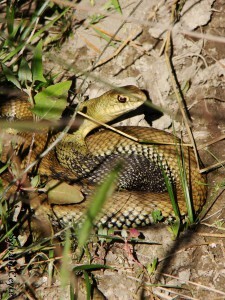 Snakes are well represented with six species. Contrary to what people can think, there are no vipers in Camargue. The viperine snake that is often observed in the water looks a bit like a viper but a careful examination of the pupil (round) remove any doubts. The grass snake is also fond of water and can sometimes be observed chasing fry or frogs.The southern smooth snake and the Aesculapian snake are less common and more present in wooded areas. The ladder snake with its characteristic lines is very fast as soon as temperatures rise. Spring or dusk are the best moments to observe it. Finally, the Montpellier snake can reach two meters long. This is the most impressive, especially when it looks up out of the vegetation, a bit like a cobra. But it is not so easy to observe it, like the ladder snake which prefers dry areas but can also occur near water..
Several turtle species have been identified on the site, only the European pond terrapin is native and naturally present in the Camargue. Very fierce, some individuals have, however, accustomed to public transit, especially near the Etourneau trails. From May, it is common to see females on dikes looking for favorable locations to dig a nest and lay their eggs. The red-eared slider is regularly observed. This exotic species has been release in nature and some individuals reproduce. Two tortoises were also identified : the Hermann’s tortoise and the greek tortoise. Their origin on the site is unknown, it is probably escaped animals from Mas-Thibert. The presence of tortoise isn’t a problem but on the contrary, the red-eared slider compete with pond terrapin or create health threats (disease transmission). 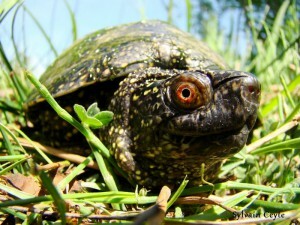 When it is possible, the red-eared slider are removed from the natural environment.